The prince has been making a point to address mental health. The Duke of Cambridge visited projects close to his heart in London on Thursday, showing his support for charities focused on men’s mental health and well-being. 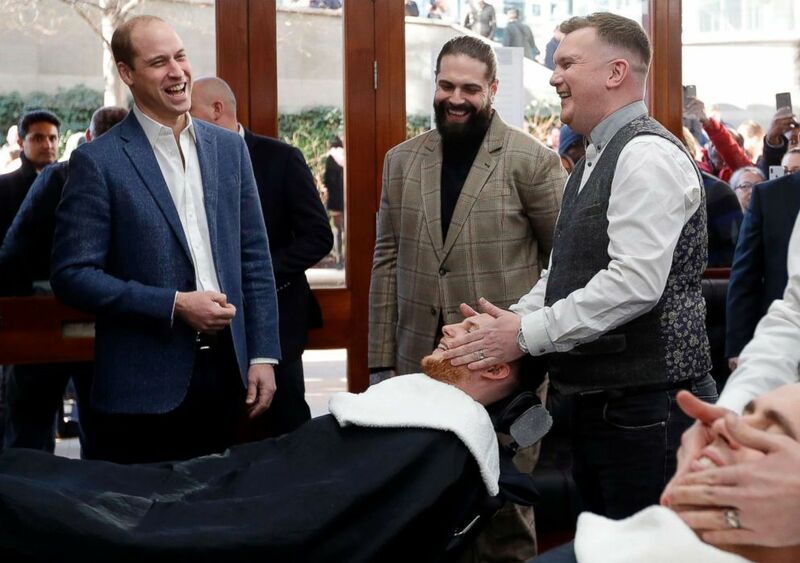 First, Prince William visited patrons of the Pall Mall Barbers, who belong to a group called the "Lions Barber Collective," which raises awareness for suicide prevention. They provide training for barbers so they can recognize signs of mental illness in their clients and encourage them to seek help. (Kirsty Wigglesworth/AFP/Getty Images) Prince William, Duke of Cambridge, speaks speaks to Dean Hamilton (R), and Paul Richardson (L) during a visit to Pall Mall Barbers in London, Feb. 14, 2019. 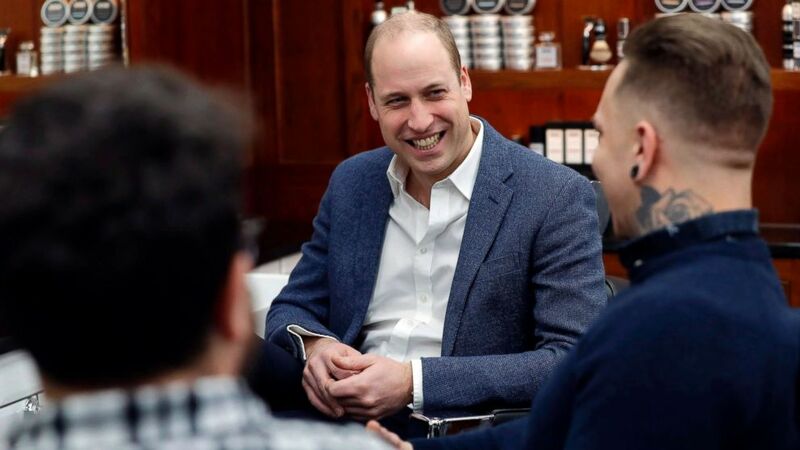 Richard Marshall, the managing director of Pall Mall Barbers, described Prince William as a "total gentleman" after meeting him Thursday morning. "We need a big push to raise more awareness for men's mental health; men don't speak about their feelings or what is going on inside their head, and so raising awareness and encouraging guys to speak to each other is really important," he told ABC News. "[Prince William] is a total gentlemen and was a lot of fun. He really got into the spirit of the moment." Then, Prince William visited the charity Future Men, an organization that provides lifestyle advice for vulnerable men. 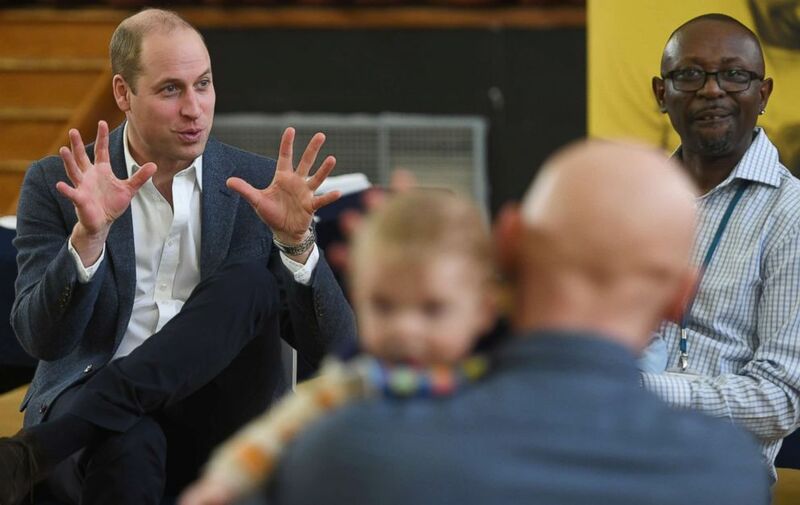 The Duke of Cambridge took part in one of the sessions of the charity’s "Future Dads" programs, which offers practical advice for dads-to-be. (Kirsty Wigglesworth/AFP/Getty Images) Britain's Prince William, Duke of Cambridge, speaks to Tom Chapman, founder of the charity Lions Barber Collective (C), and barber Daniel Davies (R), during a visit to Pall Mall Barbers in London, Feb. 14, 2019. He took the opportunity to joke about changing diapers. "It’s never straightforward," he remarked at one of Future Dad’s practical sessions. Onto the all important nappy change. Christopher Muwanguzi-Mugalu, who attended the Future Dad course with Prince William, described him as a "great guy" who "genuinely cares about men in this country" on Twitter. (Stuart C. Wilson/Getty Images) Prince William, Duke of Cambridge visits the 'Future Men' Fathers Development Programme, Feb. 14, 2019, in London. "We had a laugh, we talked about parenthood, our partners & more importantly how every dad particularly those that need it most can be reached through our #Futuredad course," he wrote. "What a great guy, and what a great father & man that genuinely cares about men in this country." Mental health has been a big focus for the younger royals in recent years according to ABC News' royal expert Victoria Murphy. "For William, men's mental health is a big concern," she said. "He has previously spoken out about the high rates of male suicide, highlighting how big a problem this is, and I think men’s mental health is something we will see him talk about more this year and make more visits to highlight." (Tim Ireland/AP) Prince William and Kate, Duchess of Cambridge arrive for the BAFTA 2019 Awards at The Royal Albert Hall in London, Feb. 10, 2019. The prince’s endorsement of these charities will come as a huge boost to their respective causes, Murphy believes, as the young royals are increasingly looking to remove the stigma around mental health. "Whenever a high profile royal visits any organization, they bring the spotlight with them so his visit will naturally be a huge boost for awareness of the issue," Murphy told ABC News. "So public visits, where they speak about and endorse the work of the charities in this area as well as meeting and speaking to people they have helped, are an important part of helping to achieve this."